On the whole, Alexander's reign was prosperous until the rise, in the east, of the Sassanids  under Ardashir I. Of the war that followed there are various accounts. According to Herodian, the Roman armies suffered a number of humiliating setbacks and defeats, while according to the Historia Augusta as well as Alexander's own dispatch to the Roman Senate, he gained great victories. Making Antioch his base, he marched at the head of his troops towards Ctesiphon, but a second army was destroyed by the Persians, and further losses were incurred by the retreating Romans in Armenia. 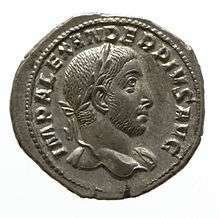 As word of the invasion spread, the Emperor took the front line and went to battle against the Germanic invaders. The Romans prepared heavily for the war against the Germanics, building a brigade of ships to carry the entire battalion across. However, at this point in Alexander's career, he still knew little about being a general. Because of this, he hoped the sole threat of his armies might be enough to persuade the Germanics to surrender. Severus enforced a strict military discipline in his men that sparked a rebellion among the Germanic legions. Due to incurring heavy losses against the Persians, and on the advice of his mother, Alexander attempted to buy the Germanic tribes off, so as to gain time. 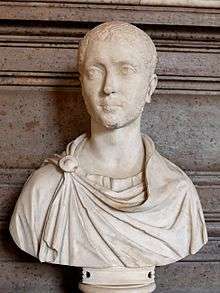 This theory has it that, in an open tent after his lunch, Alexander was consulting with his insubordinate troops, who compared him to his cousin Elagabalus, the divisive and unpopular Emperor whose own assassination paved the way for Alexander's reign. A German servant entered the tent and initiated the call for the Alexander's assassination, in which attack many of the troops joined. Alexander's attendants fought against the other troops but could not hold off the combined might of those seeking the Emperor's assassination. Within minutes, Alexander was dead. Alexander's death at the hands of his troops can also be seen as the heralding of a new role for Roman emperors. Though they were not yet expected to personally fight in battle during Alexander's time, emperors were increasingly expected to display general competence in military affairs. Thus, Alexander's taking of his mother's advice to not get involved in battle, his dishonorable and unsoldierly methods of dealing with the Germanic threat, and the relative failure of his military campaign against the Persians were all deemed highly unacceptable by the soldiers. Indeed, Maximinus was able to overthrow Alexander by "harping on his own military excellence in contrast to that feeble coward." Yet by arrogating the power to dethrone their emperor, the legions paved the way for a half-century of widespread chaos and instability. ↑ In Classical Latin, Alexander's name would be inscribed as MARCVS AVRELIVS SEVERVS ALEXANDER AVGVSTVS. ↑ 1901–1906 Jewish Encyclopedia article "Alexander Severus"
↑ "Severus Alexander". Encyclopaedia Britannica Online Academic Edition. Encyclopædia Britannica Inc., 2014. Retrieved 2 May 2014. ↑ "Alexander Severus". Capitoline Museums. 1 2 Library of World History: Containing a Record of the Human Race from the Earliest Historical Period to the Present Time; Embracing a General Survey of the Progress of Mankind in National and Social Life, Civil Government, Religion, Literature, Science and Art, Volume 3. New York Public Library: Western Press Association. p. 1442. 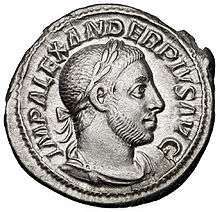 1 2 "Severus Alexander (222–235 AD): The Calm before the Storm" (PDF). The Saylor Foundation. 1 2 Valentine Nind Hopkins, Sir Richard. The Life of Alexander Severus. Princeton University: The University Press. p. 240. ↑ Browning, Robert (1983). The Cambridge History of Classical Literature: Volume 2, Latin Literature, Part 5, The Later Principat. Cambridge University Press. pp. 41–50. ISBN 978-0-521-27371-8. ↑ "Alexander Severus". Jewish Encyclopedia. ↑ Grant, Michael (1973). Jews In The Roman World. Macmillan Publishing Company. ISBN 978-0684133409. ↑ "Alexander Severus". Catholic Encyclopedia. ↑ Novak, Ralph Martin (2001). 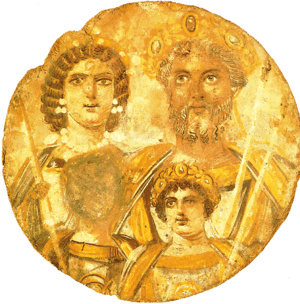 Christianity and the Roman Empire: Background Texts. Bloomsbury T&T Clark;. ISBN 978-1563383472. This article incorporates text from a publication now in the public domain: Chisholm, Hugh, ed. (1911). "Alexander Severus". Encyclopædia Britannica. 1 (11th ed.). Cambridge University Press. "Alexander Severus". Catholic Encyclopedia. 1913.